Flames dropped last night’s game to the LA Kings 0-3. I mean, LA isn’t good, they’re second last in the league, but they have been winning as of late. 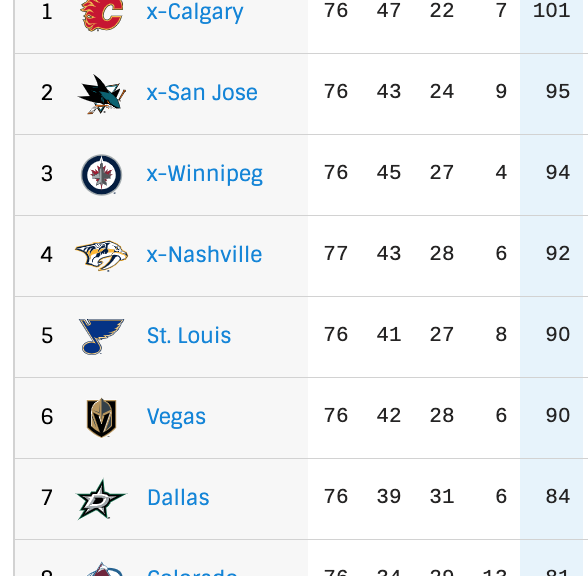 Plus, Calgary has a bit of a cushion a top of the Western Conference with SJ on a 5 game losing skid. But still…..There are some issues that need to be addressed, namely the top line. All year the likes of Monahan, Gaudreau, and Lindholm, have been lights out. But since the All-Star break things have changed. Monahan has a grand total of 4 goals in the past 2.5 months! It’s as if he’s playing injured again. Consider this. The team is, as a whole, firing on all cylinders. They’ve hit the 100 point plateau, and have done so as fast as the 88-89 Flames. All of this success comes without the likes of Monahan, Bennett, and Neal producing. Fix the issues and the Flames have a chance for a deep Cup run. What we tend to see is the squad folding under pressure when the ice gets heavy. Built for speed, Calgary won’t out muscle anybody on the ice. Playoff hockey, however, is a different beast than regular season. If that top line can’t carve out some space for Gaudreau, that’s going to be an easy line to shut down. Heck, even the lowly Kings did it all game last night. Now’s now the time to go back to the drawing board, it’s the time to dig deeper and take the reigns with the opportunity in front of you. Right now, close out the season with the top seed in the West and face off against the likes of either Colorado, Minnesota, or Arizona. Dallas tomorrow will be a stiff test to see where the team stands and who will respond. It’s gotta be more than the 4th line, despite how well they’ve been playing…..
Oh yea, and Rittich needs to play some games here.